Rose-pink outer petals with white inners protruding from the 'hearts'. Long, arching sprays of white 'bleeding heart' flowers. Felty grey edelweiss flowers on short stems over grey-green leaves. Finely divided bronze foliage with black and red button-like flower heads. Attractive silver-grey basal leaves and bladder-like seed pods. 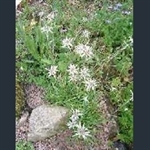 Half a dozen white flowers tipped with green; vigorous, large-flowered variety. Spring snowflake. 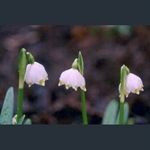 Six-petalled white, hanging flowers with green or yellow tips. Rosettes of slender, fleshy leaves and loose heads of pure whte flowers. Tuft of fleshy leaves and clusters of rich pink flowers.